I was momentarily unsure if I was in the right place as there was no line at the podium, even though it was around 1:15 or so by this time. 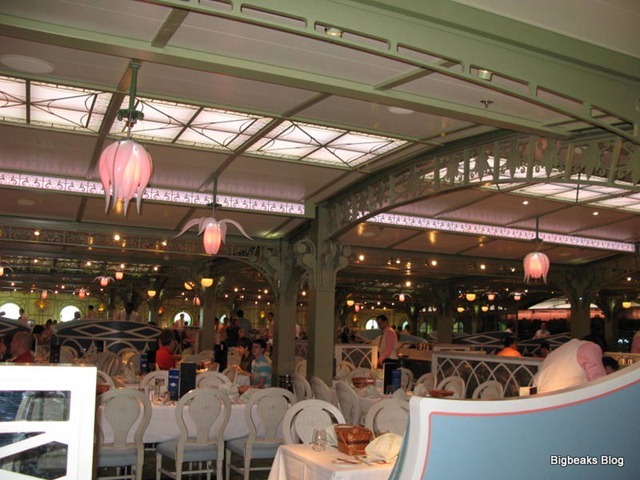 There was a crew member there, though, and she quickly confirmed that she was able to make reservations. With a quick search in the computer, she found that they did still have availability for the brunch and that I pretty much had my choice of times. I booked a reservation for 10am on Wednesday (scheduled to be our day at sea) and quickly texted my wife with the news of my success. Due to an itinerary change that I’ll explain in more detail in a later installment of the trip report, we didn’t actually get to use the reservation. Still, for those that may be frustrated by inability to book the brunch on-line, it is useful to know that booking it on-board can be very easy. After our Palo reservation was in place, I headed down to deck 7, where our stateroom was located. 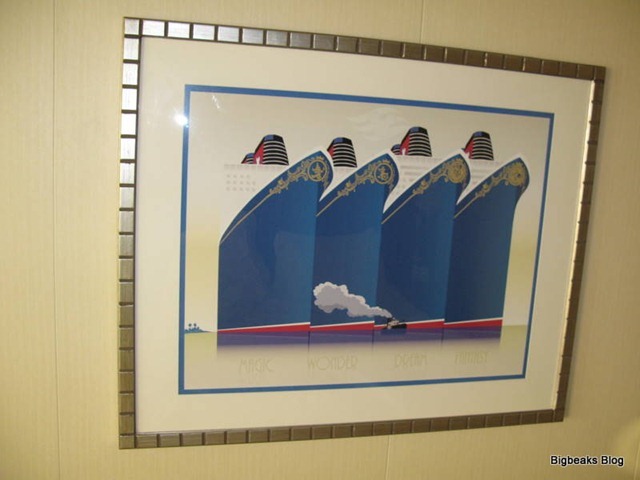 It was around 1:25 when I got there and they still had the stateroom corridors blocked off and quite a few guests had gathered in the elevator/stairwell area waiting for the staterooms to be opened up. Very shortly after 1:30, the stateroom host opened up access and the guests were able to proceed to the rooms. I was a bit surprised to find my wife and son already in the room when I got there. My wife has a minor disability and uses a cane. When the stateroom host saw her, he asked for the room number and let her go ahead to the room early, since he knew it was ready. I thought that was a nice bit of good customer service. 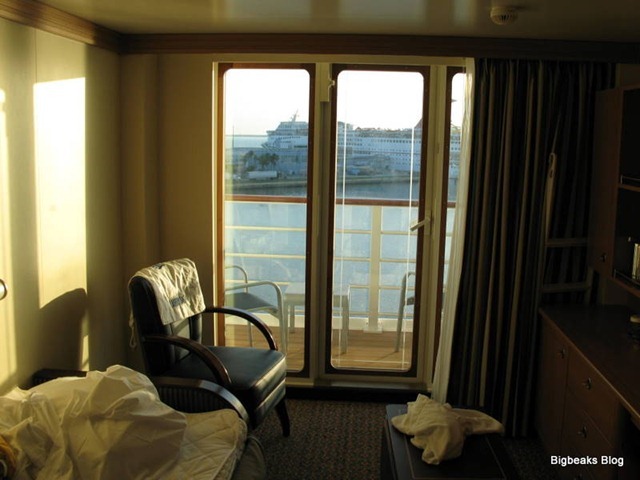 Our stateroom was number 7088, classified as a "Deluxe Family Oceanview Stateroom with Veranda". The room is located mid-ship, a relatively short distance from the elevators. 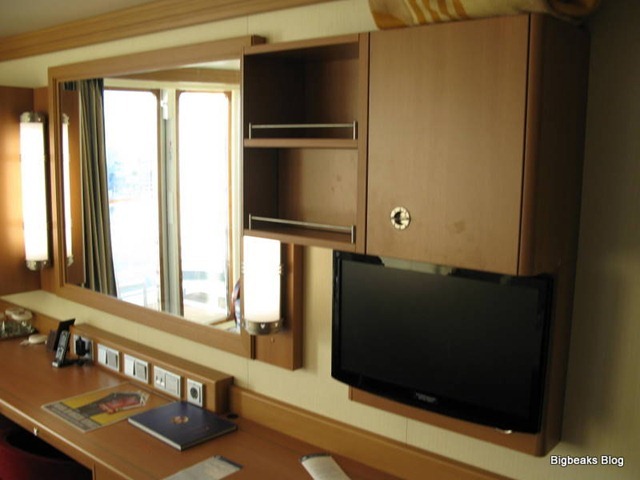 Family staterooms are a bit larger than regular staterooms: 299 square feet including the veranda versus 246 square feet for a standard veranda room. The room features a pull-out sofa-bed and a wall and or ceiling pull out bed, in addition to the standard queen sized bed. A thick curtain separates the regular queen bed from the living room area, where the sofa and pull-down beds are located. The room has a split bathroom, with a toilet and sink in a separate room from the shower and (very tiny) bathtub. From what I’ve seen, the additional space is really the only major difference between a family stateroom and a standard ocean view room. 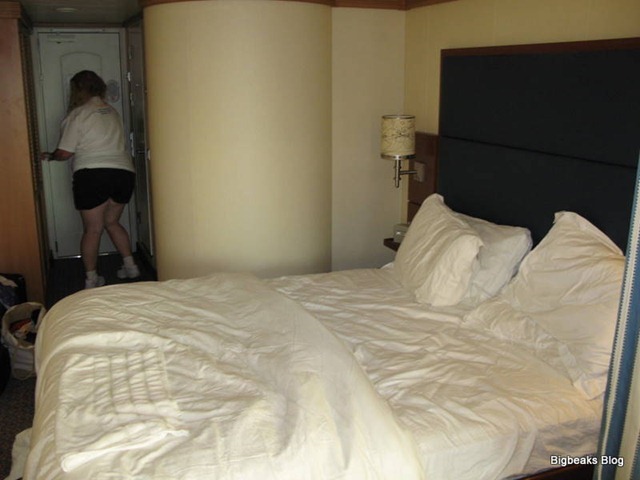 Because staterooms on a cruise ship tend to be small, it was nice having the bit of extra space, although I’m not sure I would be likely to pay the extra for the family stateroom on future cruises. The extra space wasn’t really all that important, considering that we are only a family of 3 and I was under the mistaken impression that some of the other amenities, such as the privacy curtain, were exclusive to this type of room. The value of the extra space is also reduced on the Dream due to very good use of space, including the bed being raised enough to allow storage of luggage underneath. The staterooms on the Dream include a few high tech elements that are somewhat upgraded from what was previously offered on the Magic and Wonder. The way you open the door is the first upgrade that a guest is likely to encounter. Unlike the usual key slot found on the other ships (and most hotels), the door has a flat pad above the door knob and all you have to do is hold the Key to the World card (stateroom key) in front of it to unlock. This is particularly nice for young kids as there is no need to orient the card in a specific direction. A somewhat controversial new feature of the staterooms is their energy saver power system. When you first enter the room, you place your Key to the World card into a slot next to the door, which then activates all the room’s power systems. This includes the lights, the air conditioning, and all of the electric outlets. The slot actually will accept any card with a magnetic stripe, so we sometimes would use other cards (such as grocery store reward cards) in order to reduce the likelihood of accidentally forgetting a Key to the World card when leaving the room. The stateroom hosts are trained to remove any cards left in the slot when the guests aren’t in the room, though. I think this system makes some sense, but I do think they should have at least one outlet remain always powered for guests that want to recharge cameras or other electronic devices while away from the room. I also worry that the rooms might get awfully warm during the summer months with the air conditioning off while the guests are away. A really nice improvement on the Dream that hasn’t gotten a lot of attention is the substantial upgrade to the television system. The TVs are modern, 22-inch flat screen HDTVs and they are now connected with a video-on-demand system in addition to the somewhat limited selection of mostly Disney-owned live channels. The video-on-demand system provides access to a pretty wide variety of Disney movies, both animated and live action. They even offered a small selection of very recent non-Disney movies. I specifically noticed that the most recent "Harry Potter" film was one of the choices. Informational material such as the shore excursion and port shopping presentations and the disembarkation lecture are also available for viewing on-demand. It is not a pay-per-view system as all of the video-on-demand content is available at no extra charge. Once you start watching a program, you can resume playback at any time for a period of 48 hours after you start it. The 48 hour limit did seem a bit weird since this is not a pay-per-view system, but it probably is either a result of licensing restrictions or Disney simply adapted standard hotel pay-per-view software and didn’t have an easy way to remove that restriction. We found this system to be a great way to keep our son entertained while my wife and I were showering or getting dressed or during a few brief occasions where we had some down time in the room before heading off to scheduled events. Another relatively new feature (also recently added to the other ships) is the inclusion of a couple cell phones for the guests’ use throughout the cruise. These Wave Phones (as Disney calls them) provide basic voice and text messaging. They can call any other Wave Phone or the stateroom phones and can text with each other. They are a nice convenience to have on the cruise, although we didn’t really use them much. Each stateroom has two Wave Phones, but only one charger, which means you have to do a bit of scheduling to keep them charged. The power saving system also means you can’t charge the phones when you aren’t in the room.